The KNM WT 17000 cranium is missing some bone fragments from the face, particularly from the maxillary sinus; the posterior portion of the frontal; the frontal processes of the zygomatics; the anterior portion of the parietal bones; most of the zygomatic arches; a portion of the pterygoid regions; right side of palate; posterior portion of the maxilla; the occipital bone on the inferior part of the nuchal area2,4. All of the tooth crowns are absent with the exception for half of a molar and the right P32,4. KNM WT 17000 had a relatively small cranial capacity, only reaching about 410 cc1. Besides having a small neurocranium, the face, palate, and cranial base are all very massively built4. The large sagittal crest preserved on KNM WT 17000 suggests powerful biting forces. 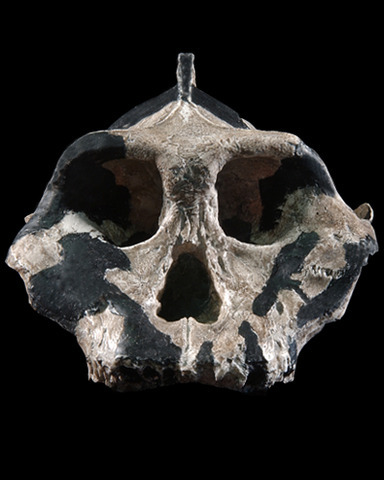 The Black Skull has many primitive features in common with Australopithecus afarensis, such as a flat cranial base, mid facial and subnasal prognathism, a relatively flat glenoid fossa, a small cranial capacity and pneumatization of the base of the crania1. Features that distinguish the Black Skull from A. afarensis include a dish-shaped midface, forward facing zygomatics, a heart-shaped foramen magnum, and massive molars and molarization of the premolars relative to the incisors and canines1. Klein RG. 2009. The Human Career: Human Biological and Cultural Origins. Third Edition. Chicago: The University of Chicago Press. Leakey REF and Walker A. 1988. New Australopithecus boisei specimens from East and West Lake Turkana, Kenya. American Journal of Physical Anthropology 76: 1-24. Schwartz JH and Tattersall I. 2005. The Human Fossil Record: Craniodental Morphology of Early Hominids (Genera Australopithecus, Paranthropus, Orrorin), and Overview. Volume 4. Hoboken: Wiley Liss. Walker A, Leakey RE, Harris JM and Brown FH. 1986. 2.5-Myr Australopithecus boisei from west of Lake Turkana, Kenya. Nature 322: 517-522.